When you think of chic cafes and fine dining in Sydney, Quay, Rockpool and Aria may come to mind. What you may not realise is that Parramatta is home to some great award-winning restaurants and cafes, like Circa, who won the Good Cafe Guide’s Best Cafe award in 2013. Otherwise known as Eat Street, Church Street is Parramatta’s most popular eating hub. The street is buzzing with activity and whether you choose to catch up for dinner and drinks with friends or simply prefer to take a seat at one of the alfresco dining tables and watch the city goers go by, you’ll always find the perfect place on Church Street. Chilli Jam: If you love Thai flavours, you can’t go past Parramatta’s Chilli Jam. Opt for the delicious tom yum goong soup or try your hand at creating your own dish with your choice of meat, seafood, veg or tofu, paired with an incredible sauce and noodles. Chocolateria San Churro: If you’ve got a sweet tooth, no trip to Church Street is complete without a stop at Chocolateria San Churro. To make the most of the delicious treats on offer, sink your teeth into a mouth-watering chocolate tapas plate. Criniti’s Southern Italian Cuisine: When an establishment is buzzing as much as this place, you know the food has to be pretty good. Criniti’s is a favourite with the locals, who keep coming back for the sumptuous wood fired pizzas. Grill’d: Grill’d is a relative newcomer to the strip but the healthy, fresh and flavoursome burgers are already a big hit with the locals. The burger menu is long, the food quick and the prices offer great value for money. Harry’s Cafe De Wheels: Harry’s iconic moveable cart has been around since 1938, when Harry Edwards first opened his caravan cafe near the gates of the Woolloomooloo naval dockyard. The cart still stands there today, as well as other locations and Parramatta’s own cart is a welcome addition for the city’s pie lovers. Restaurant 3 One 7: Known for its chargrilled seafood and large selection of pizzas and pastas, Restaurant 3 One 7 is an ideal place for a meal with friends. The seafood platter is great value. Nut N Fancy: Another restaurant for the sweet tooths, Nut N Fancy offers pancakes, waffles and a range of lip-smacking ice cream sundaes. More than that, however, this quirky restaurant offers tantalising meals such as vodka infused chicken and prawns with a creamy napolitana sauce. Dragon Peking Restaurant: Serving traditional Southern Chinese dishes, Dragon Peking is a firm favourite. Try the stir-fried pork ribs and shallots or the whole fried snapper with salt & pepper. I Chi Ban Japanese: I Chi Ban offers a range of ‘bento box’ lunches for under $12, offering fantastic value for money. By night, the restaurant switches to a Teppanyaki style restaurant. Miho Japanese Bakery & Cakes: For delicious sweet treats, Asian style, head to Miho Japanese Bakery and sample a delicious cake or sticky bun. Visit early enough and you can pick up a warm egg custard tart for just $1 or their Japanese style milk bread for only $2.70. Phillip Street: Phillip Street is where you will find a selection of fine dining restaurants that overlook the magnificent river. For something special, this is the dining hot spot for you. Barnaby’s: Known for its sensational seasonal menu, Barnaby’s serves up modern Australian cuisine in a rustic old colonial building. Home to an extensive wine list and prime steaks from $32, this is where you should dine if you’re looking to impress. Inside Out: Inside Out is the perfect spot for a business lunch or an intimate dinner with your loved one. With a sleek design, balcony terrace and dishes such as carpaccio of smoked salmon with king prawns, this restaurant is not one to be missed. Kings Indian Cont. : Since opening its doors in 2009, Kings Indian Cont. has received nothing but positive reviews. The indian flavours are authentic and their house specialties, that include ‘Nehari Gosht’ of tender baby goat shanks, has locals returning again and again. George Street is where you will find the city’s trendy youth, offering a wide range of eateries, lively beer gardens and a whole host of cafes serving unbeatable coffee. On a trip to George Street, you will always find something new and exciting and will love the energy of the relaxed strip. Cafe One 80: While you may struggle to get a table at times, Cafe One 80 is well worth the wait and a big hit with both locals and visitors. Their daily changing menu receives a roaring lunch trade and their burgers are some of the best around. Collector Garden Bistro: The Collector Hotel is one of Parramatta’s premier party venues and is home to the innovative Chill Bistro. Whether meeting friends for a snack and a few drinks or sitting down to a delicious meal, you can be sure you’ll have a fun time at the Collector Hotel. Roxy Bistro: If you love to be in the heart of it all, Roxy Bistro is perfectly positioned in the central courtyard of the busy entertainment venue, The Roxy. Offering a huge all-day menu ranging from toasted sandwiches to pizzas, the cafe offers a range of great pub meals. Harris Park is home to an eclectic mix of restaurants, highlighting Parramatta’s diverse culture. Chutney: With nearly 140 choices on the menu, you won’t know where to start when dining at Chutney, Harris Park’s most mouth-wateringly delicious Indian restaurant. The food is so good that no matter what you choose, you won’t go home disappointed. Okori Teppanyaki: In the heart of Harris park sits Okori Teppanyaki, a traditional Japanese restaurant. 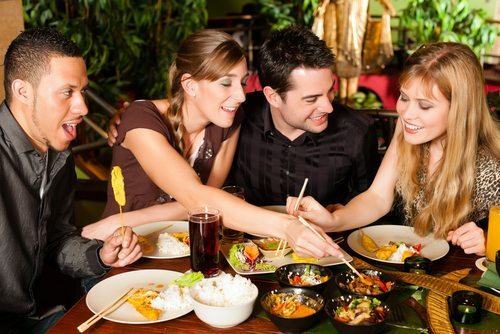 For a fun-filled meal with all the trimmings, Okori is a great place for dining with a group of friends. The Olive Greek Restaurant: One of the most iconic restaurants in Harris Park is the popular Olive Greek Restaurant and Bar, home to heavenly dishes such as the lemon baked lamb, which literally falls off the bone. If planning a meal here, you’re best to book as tables fill up fast. Wherever you choose to dine in Parramatta, you’ll soon discover it is one of the hottest places to grab a bite to eat. And the good news is that as the city asserts itself as a firm favourite on Australia’s foodie trail, Parramatta’s dining scene can only get better.